Photography and Text By Ed Jeavons © All rights reserved. For those that have never heard of using a laser pointer with your camera before, it is a way that some people have found to help their camera focus on a subject when the ambient light is too dim for the camera to do it on its own. 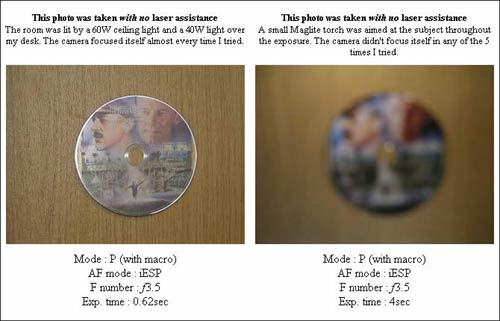 Those with focus assist lamps or a manual focus facility can often get around this problem, but many users who don’t have these are stuck with blurry photos! Using a laser pointer with a patterned head, you can shine a bright image onto the subject and give the camera something to lock onto. I was extremely happy with the results I got from my experiment, however I only did a short range test (about 2 meters) and I suspect that it wouldn't be so effective for medium or long range focusing. As an estimate, it's probably a good technique within the range of camera's built-in flash; for anything above that I think that the pattern generated by the laser would get too big and the cheap pointers wouldn't be powerful enough to make a nice bright image. Below is a run-through of some of the pictures I took during the experiment. Bear in mind that apart from the light sources I have specified, the room I was in is pitch black and the camera's flash was not used. 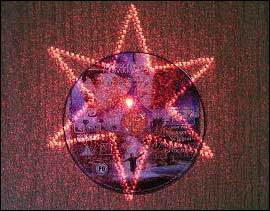 Finally, here is a photo showing the type of laser pattern I used for the photo above. I tried three different patterns (the one below, a basic arrow shape, and an outline of a UFO) and all of them worked as well as each other. I didn't bother testing it using a basic dot because I knew that this wouldn't work. Just to clarify, the following procedure was followed on my Olympus C-730 to take photos using the laser as a focus assist. Without the laser switched on, aim the camera at the subject and press the AEL button to lock the exposure. This is because the brightness of the laser may well affect any shutter speeds etc. that the camera should be using after it's been turned off. 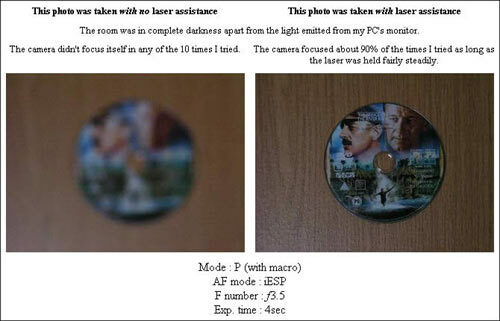 Point the laser at the subject and press the camera's shutter button halfway so it can find and lock its focus. Turn the laser off and press the shutter button all the way down to take the photo. For those not familiar with such laser pointers, I got this one from www.laserpointers.co.uk and it's their "Budget 12 Head Laser pointer" which only cost me a few pounds.